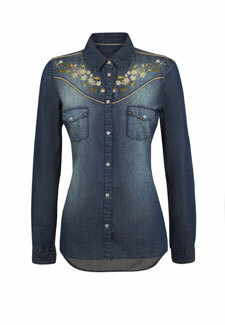 Fashion Q&A: Where can I buy a denim shirt? Q: I have been trying to buy a denim shirt with studding but have not managed to find one. Do you know any that are going into stores for the Spring? A: Have a look at the new collection going in store at George@Asda they have a great dark denim style which I’m loving and look at the price – £14, and it comes in sizes 8-20. If this isn’t what you’re looking for, still check out the website as they have lots of other styles.